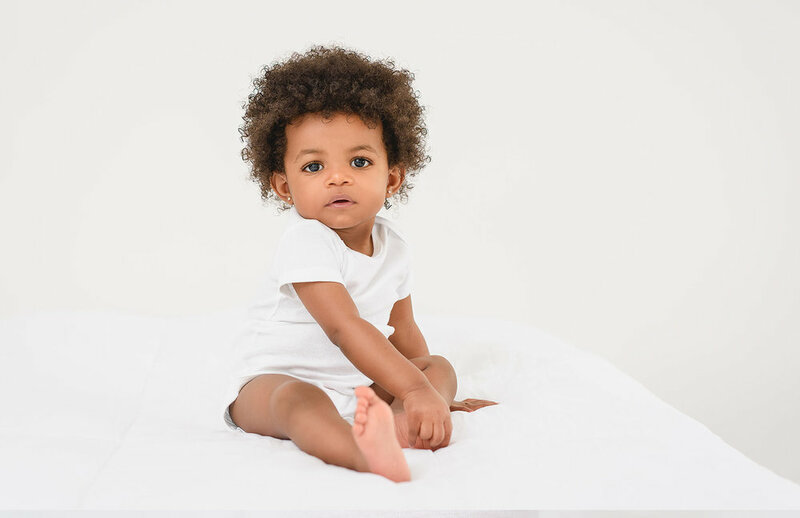 Limited-edition sessions for babies and children, perfect for capturing milestones and celebrating the uniqueness of your child using N. Lalor Photography’s signature clean and bright style. *Please note that all images are purchased separately after the session. Fill out the form below. We’ll chat on the phone to go over everything so you’re ready for the session. Enjoy an easy baby portrait session with multiple outfit changes in the Studio. Final retouched portraits are presented to you at an in-person Ordering Appointment. You should never pay for something you don’t absolutely love! An unconditional guarantee is included with every session. Studio Portrait Session for your baby or child (siblings welcome!). Session Fee includes 45 minutes in front of the camera and an in-person presentation of final images about 1 week after the session. Please note that the Session Fee does NOT include any products or images, as those are purchased separately. What does this $99 Session include? The Session Fee includes 45 minutes in the Studio for your little one (and any siblings), multiple outfit changes, a consultation call with the Photographer to make sure we capture the exact images you’re looking for, and an in-person Ordering Appointment where you will view the final retouched images from the session, which are available for purchase. **Please note that all portraits are purchased separately after the session to allow for best flexibility and choice for each Client. Bring your child, a white onesie or a simple light-colored outfit, a couple of additional clothing choices, diapers (if needed), a drink, non-staining snack, and a favorite toy or book for your child. These sessions are specifically designed to be super easy for parents, with a convenient Studio environment and parking. Printed portraits start at $295 each and include the high resolution digital version of the image in both color and black and white, with a full print release. Collections are also available with built-in savings. What photo paper are the images printed on? Final images will be ready for you to review about 1 week after the session (this is when we’ll sit down and you decide which portraits you’d like to buy). Once purchased, prints are ready within a few days, with digital copies delivered to your email inbox within 24 hours. Please fill out the form above and select your desired time to book your spot. We will then schedule a time to talk on the phone and go over all the details. You will also receive a digital Session Guide, reminder emails, and Product Guide. If, for any reason, you change your mind or no longer wish to move forward, you will receive a full refund of the Session Fee.